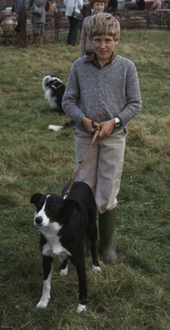 Border collies were the dominant breed in my early life, but my first experience was traumatic. I was given Flossy as a puppy when I was three years old. The excitement of her arrival was short-lived. A visitor to the farm left a gate open, she escaped onto the road and was killed. I don't even have a photograph to remind me, but the impact of her loss was huge and probably accounts for my enduring sentimentality about dogs. 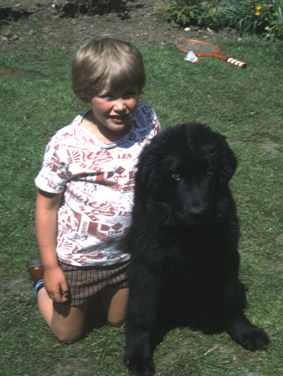 My next dog was Roy, a rough-haired black-and-tan, who was my constant companion until my early teens. 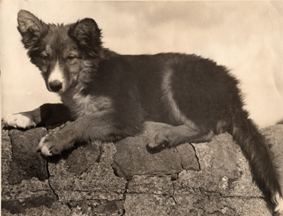 This old photograph shows him as a pup sitting on the wall outside the back door of the farmhouse. He was a working dog, who did his fair share on the farm, but frequently accompanied me on forays into Deepdale (a tributary of the Tees) where I built dams and he tried to catch running water. I moved into different territory with Floss. I bought her as a trained tria ls dog, when she was full of experience and I was a novice. 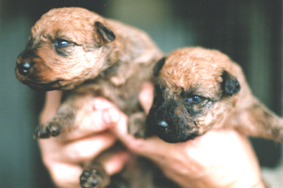 She kept the British Milksheep in order when I farmed in Hampshire and Wiltshire,and produced a fine litter of six pups. 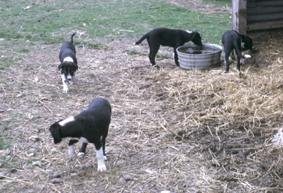 The photograph (right) shows four of them pottering around the farmyard in Hampshire. Five were sold, but Meg was retained, and was joined by Nellie. Nellie was an unassuming little dog. Happy to stay in the background, but desperate for affection . 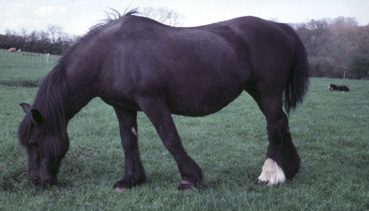 My only photograph (far right above) shows her lying quietly and unobtrusively in the field in Wiltshire beyond Dinah, the old retired Dales Pony - a fine example of longevity at 37 years of age. 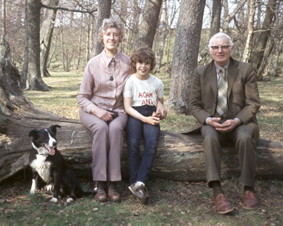 During this time my parents continued to live in Teesdale. They had several working dogs, including another Floss which seemed to be a popular name. They also had a lovely feckless fellow called Rec, who was as endearing as he was useless for work. He is pictured here on the right (left of picture in an old damaged photograph) with Floss. 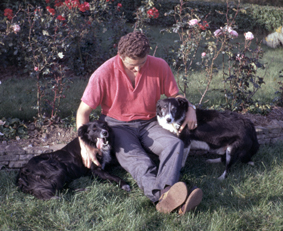 When father retired from farming, he still was involved with livestock, and their border collie at that time, Tess, had a charmed life. She arrived as a pup when parents were living in town, and never had to work too hard for a living. She went on family outings (right) and on holiday, and even entered Shows (far right). When father retired completely she continued as a faithful companion, and when she finally died at 19 years of age, both parents were devastated. When I moved from Wiltshire to N orthum berland, a new breed entered the scene. 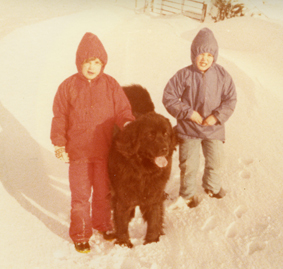 Bonny (below right), a Newfoundland, came as a house-warming present. There were two large lakes (c.200 acres in total) on the property and the life-saving skills of a water-loving breed seemed excellent security for two young schildren. Bonny was a great companion for Becky and Dan (as the two photos - left and centre - show), but unfortunately could never be persuaded to go in the water. However, she revelled in the snow of the severe winter of 1979, and lived to 12 years - a ripe old age for a large breed. Thereafter, the breed changed again. 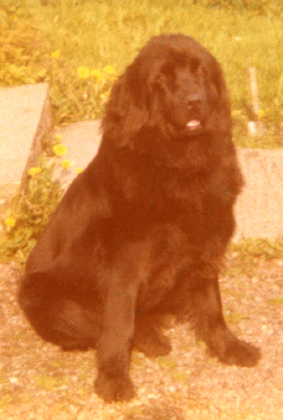 Freddie (1991-2005), a golden labrado r, kept my weight within bounds as we trekked over the hills of Shropshire. His crazy moments lasted well into old age when he still thought he was a pup. 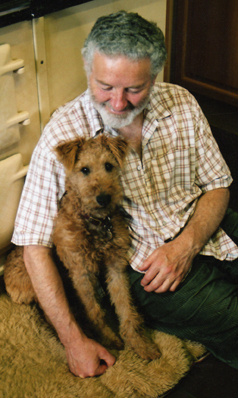 He was a delightful dog. Food was his passion, but obedience his forte. A full bowl of food could be left with him, and it would not be touched until permission was given. 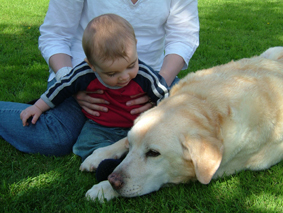 He was the gentlest dog, and formed a close bond with grandson Henry (right), one at the beginning of life, the other at the end. 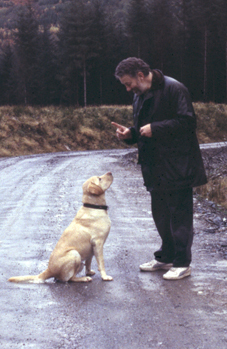 The other picture shows him in the prime of life during a wet visit to Scotland. Although a gundog of impeccable breeding, Freddie only caught one pheasant in his life, and was so surprised he forgot to let it go. Rhuaridh (Rory in English) continued my exercise regime. 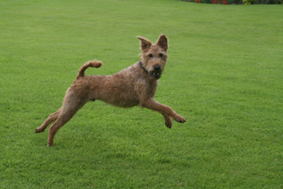 He arrived in 2005 and is altogether a different proposition - a feisty Irish Terrier. He cares very little for food, and regards obedience as a tiresome imposition. He pointedly ignores instructions, until he is sure they no longer are being given. He is a highly sociable dog (remarkable for the breed) and insists on an effusive greeting for humans and canines alike, but has an equally predatory attitude to squirrels and rabbits. 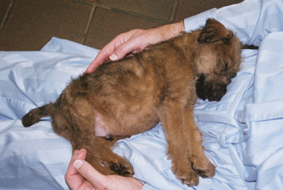 The pictures below show him (clockwise from left) at 3 weeks of age with a sibling, sleeping peacefully on his favourite blue dressing gown at 8 weeks of age, showing off his paces, and a warm seat beside the Aga.